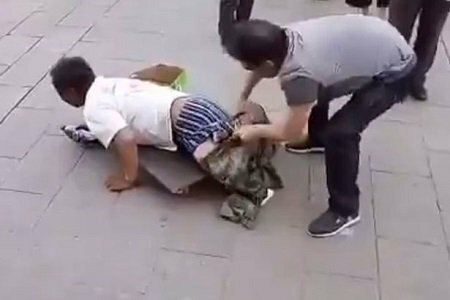 A man who was pretending to be a disabled beggar got busted after a passerby suspected foul play. This is the shocking moment a man who was pretending to be a beggar was exposed in front of many people by a passerby who suspected him to be a fraud. A video showing the moment the incident occurred has been circulating on the internet. The exact location where it was filmed is not known but it is suspected to have happened in China.